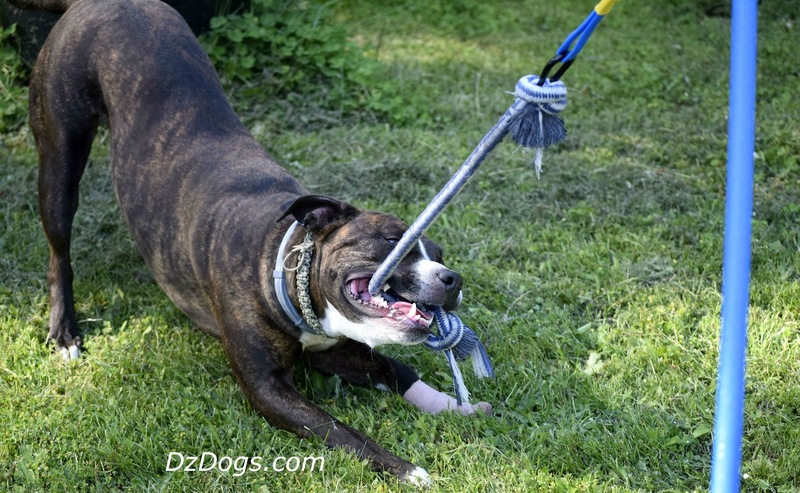 DZ's Adventures: Tether Tug Fun!! 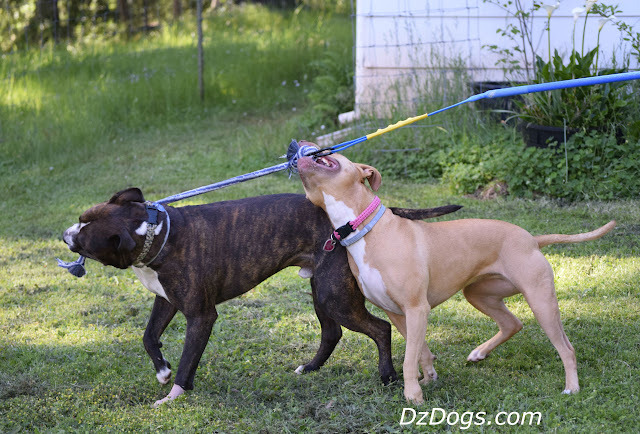 Is your dog a tug of war fiend? Dante is!! We were very excited to be contacted by Tether Tug to put one of their toys to the test and what a hit!! Tether Tug is a small US company located in Missouri, each tug toy is handmade with care to ensure quality and fun for both you and your dog. 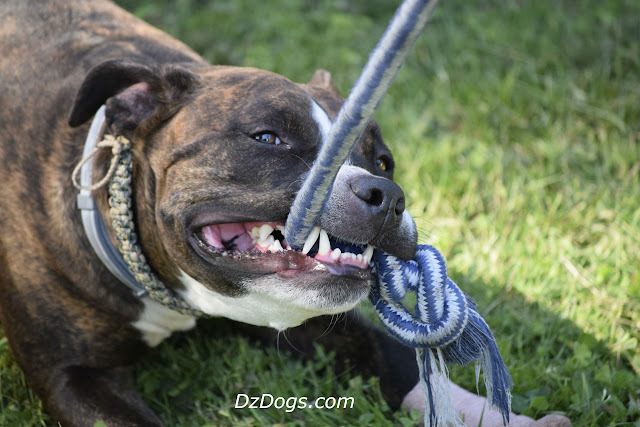 Does Tug With Your Dog Cause Aggression? Short answer: NO. Dante's very favorite game of all time is tug, he pulls, growls, strains, and if you aren't careful will knock you over to get that toy! One urban myth regarding tug is that it can cause aggression - let me repeat... URBAN MYTH. Tug is great for physical exercise! The fact of the matter is, tug is a great way to expend a lot of your dogs energy in a quick and timely manner! It's fun for them and a great workout for everyone involved, we often joke that Dante is our 75 pound dumb bell. 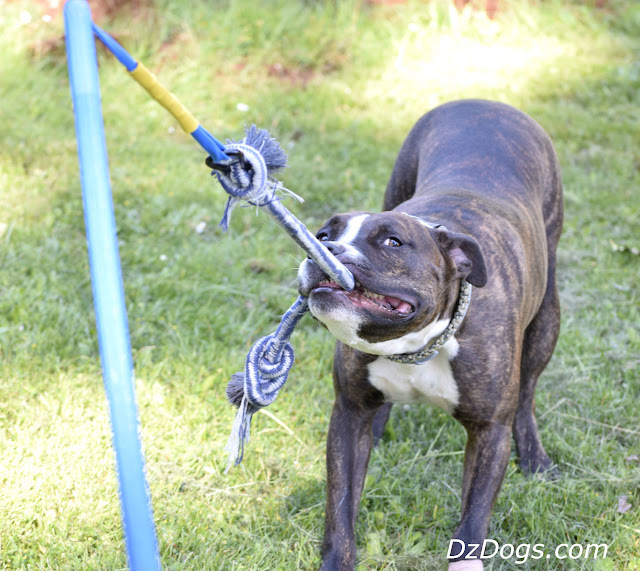 Tug is great for mental exercise! 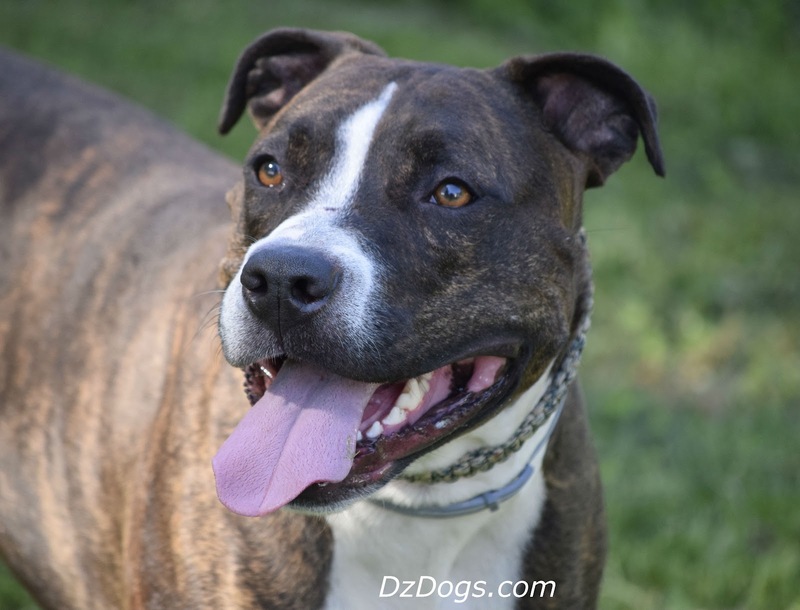 Tug is also a great way to teach your dog self control. One of our favorite games is "Let Go", to play we get Dante all riled up and tugging like crazy. Then we just all of a sudden say, "let go" and he has to drop it. "Let Go" is my phrase, some people prefer to use the phrase "drop it". It drives my mom nuts that my dogs know "let go" instead of "drop it". But for whatever reason it was just easier for me during training to say, "let go". You can pick any phrase you want as long as you're consistent. The Tether Tug though is a supervised solo game for your pup, which is great if you want to kick back and watch the fun happen. 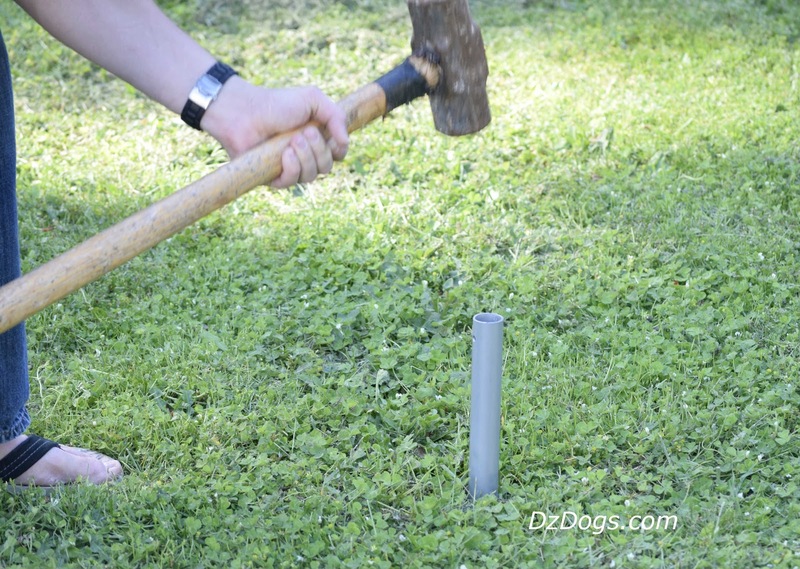 First you have to pound in the ground stake for the tug toy, it comes in the box so you don't have to worry about getting lost in your local hardware store to find something that will work. Pick a spot in your yard where you don't mind a hole though, because all of the tugging will loosen up the stake over time and you'll be left with a decent sized hole in the lawn. Also make sure to place it away from obstacles and walkways so it isn't a trip hazard. Next, plop the tug stick in the steel stake and have at it! Dante needed a bit of encouraging since he's used to having us on the other end. But he quickly got the hang of it! It is important to supervise your dog when playing with the tether tug, Dante was getting a bit high up on the rope during his play and we had to stop him a couple times to reset his grip so that he wasn't biting the metal carabiner at the top of the rope. The Tether Tug also makes for a great flirt pole! Even Ziva who isn't really into the game of tug had to get in on the action! In case you don't know - a "Flirt Pole" is basically like a giant cat toy for dogs, you hold the end of the stick and flip/flop it around while they chase and tug on it! We used it initially as a flirt pole to spike Dante's interest, but now he'll play with it on his own if we set it up for him. - Each tether tug toy is handmade and comes with a warranty that covers any product defect in materials. - Great way to expend energy fast! - Fun way to exercise the dogs. - Comes on a tough rope that can easily be replaced when it dies. - Comes with everything you need to get started playing. 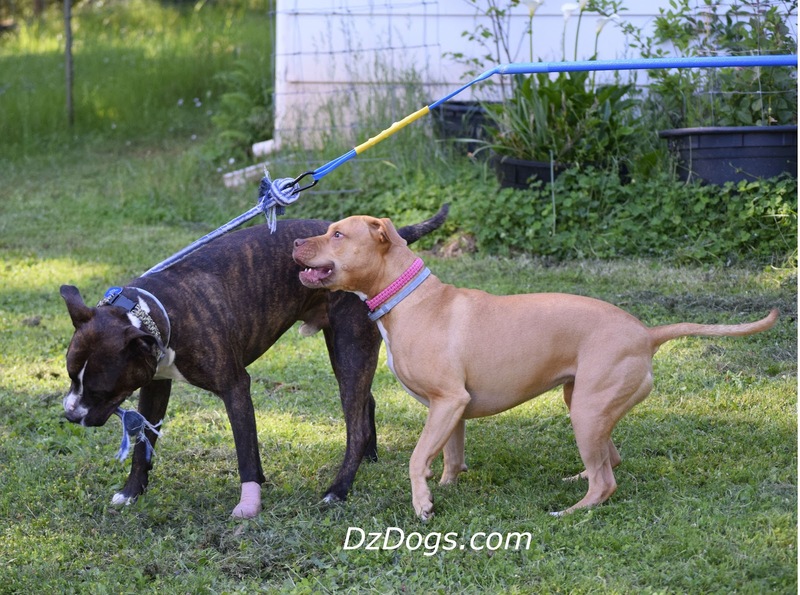 - Orders over $65 are free shipping in the U.S.
- Make sure you supervise your dogs when playing with the tether tug so that they don't hurt their mouths by biting on the metal carabiner. - Make sure you get the right size. Tether Tug comes in multiple sizes to meet your pups needs, prices range from $49.99 to $64.99. 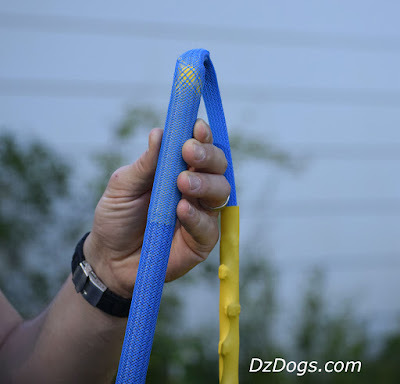 They also have an Indoor Tether Tug (recommended for dogs under 30 pounds) that is designed to slide under a heavy piece of furniture for tugging fun. We ordered a size XL for Dante who weighs about 75 pounds, we didn't think we'd need the "Uber" size for tough tuggers but now I'm wishing we had asked for it instead. Within one play session Dante strained the tough mesh netting on the toy. It is still holding up and hasn't broken, but I imagine it is only a matter of time. Overall we loved this toy! Me and Stanley like to tug. We bet this is a blast!